Anyone interested in coming out to a horse show on Sunday?? We will be dong some schooling and coaching at the Triple C Saddle Club show in Shedden this weekend. The performance events like western pleasure, trail and horsemanship will all take place throughout the morning. 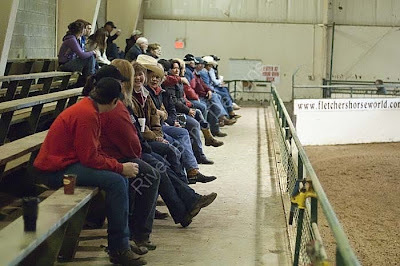 The gaming events like barrel racing and pole bending will be in the afternoon. The reining will be somewhere in the middle of the day. The Triple C Saddle Club has a website www.triplecsaddleclub.com as well as a Facebook page where you can find a more specific class list. 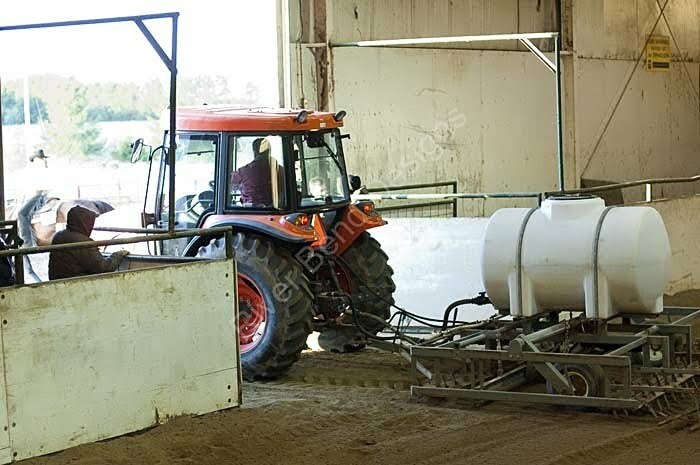 The address for the show ground is 35921 Talbot Line, Shedden ON. If you are not able to come out this weekend to the show, there will be plenty of other opportunities this season. Ask us about our plans and check back to the website and Facebook page regularly. Hooray for everyone who participated in our Spring Horse Show/Exhibition May 16th!!! Exhibitors did a fantastic job and learned some great lessons! An extra special thanks to the volunteers and sponsors. Heritage Country Gardens came through for us again with some flowers for our beautiful winner's circle. Teresa Corrigan very generously donated sunglasses for every exhibitor! Thanks to Cathy and Olivia Coish for their prize donations, as well as for their help in the kitchen with the food booth. Thanks to Karen Pratt for her prize donations and for her help all day until the very end. Thanks to Legg's General Store in Lucan for their generous prize donations, and to Cathy Haggarty for her leg work for these prizes. Thanks to Keith Hayes for providing some fabulous gift card prizes for our Egg n' Spoon challenge as well as to the Ferguson family once again for their great horsey-prizes. Thanks to the Karlsons for use of their karaoke machine and for the special snacks they brought for the volunteers at the end of the day. Thanks to Simply Candy for some yummy treats. Thanks to everyone who pitched in and helped out: Monique Hoffer, Emily Ponte and Martha Zimmerman, Lindsey Tapp etc etc etc. Another congratulations and thank you to Presley Delellis and Sydney Karlson for their fantastic rendition of OH Canada to start out our day! Great job girls! A HUGE thanks to Nicole Van Esch for her help and support all day and throughout the week leading up to the show. Thanks to our photographer, Teresa Gilroy for her hard work the day of the show. Teresa has got pictures ready for us to view at the barn, in a photo album. Teresa has given us some very special rates for this show, and the photos look great! Please make sure you get a chance to view these at the farm before the end of June to make your orders. Once again: thank you, thank you, thank you!!! And Congratulations! Jlo's filly Shorty is now 3 years old and will be shown for the first time this year! She's proving to be very much like her mom, but a little stockier. We don't have any pictures of Blondie's yearling yet, but here is the 2 year old by Mr. Boomerjac. This filly has been handled a little bit, lunged and had a saddle on. She will be coming in for more training in the next couple weeks. In the next few weeks the vet will be out to do a little check up and check to see if everything is happy and healthy and hopefully not twins! Keep your fingers crossed for us, and let's hear some name suggestions! In case you've been out of the loop: Peanut, my show horse from last year was bred in the middle of March. The first breeding wasn't successful as she had a cluster of eggs. Fertility of a cluster of eggs is inprobable, so we took the safest bet and put her on a drug that would do two things. The first was to decrease the chances of aborting a possible pregnancy (even though unlikely). The second was to regulate the heat cycle and increase the chances of fertility from a second breeding. The second breeding took place and as of right now all systems are go! We decided to breed Peanut to a stud called Genzanit. Genzanit, or "Dunnit" as we call him around the barn, has an extensive show record, a fabulous mentality and hopefully some physical attributes to offset some of Peanut's weaknesses. We are waiting for the appointment with the vet before we start an official countdown...stay tuned! The ORHA Spring Thaw Horse show at Fletcher's Horseworld on May 8th and 9th was the beginning of a brand new season on a brand new horse! "Twist" or "Peppy" as we call her around the barn is a bronze winner at just 4 years of age. Due to very petite bone structure, Peppy was given most of her two year old year off. 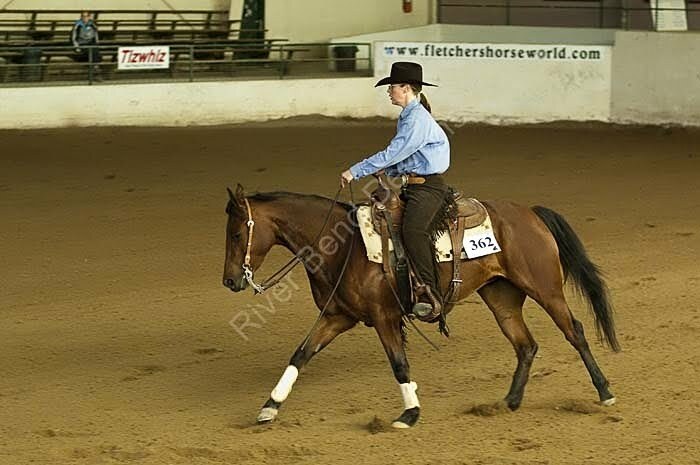 Training for any horses, and especially for young reining horse can be very stressful on young bones, so in this case it was decided to let Peppy have an extra year to grow up. Look kind of familiar? Yes, Peppy was in training with me as a yearling. Now, three years later, I have the opportunity to ride her and show her! The show at Fletcher's HorseWorld was a great experience for us. Peppy got to see all the sights and sounds of the horse show, LOTS of riding (even through the torrential downpour and high winds...), and got to be in the ring by herself in the Rookie Professional class. Other than a few minor distractions, we had a pretty good run. A few more shows are lined up for Peppy and I this season, we will keep you updated on her progress! Check out this video from Congress '09. Think out horsemanship patterns in preparation for the horse show coming up are complicated????? Think again! Our group of riders from Florida will be here June 25th-June 28th for their first trip to Canada! We will be hosting riding lessons, some fun horsey-events and a trip to Niagara Falls. We are looking for a couple of volunteer host families to give these girls a place to stay for a couple nights. Got an extra room? A pull-out couch? Please contact me if you are interested in finding out what would be involved. 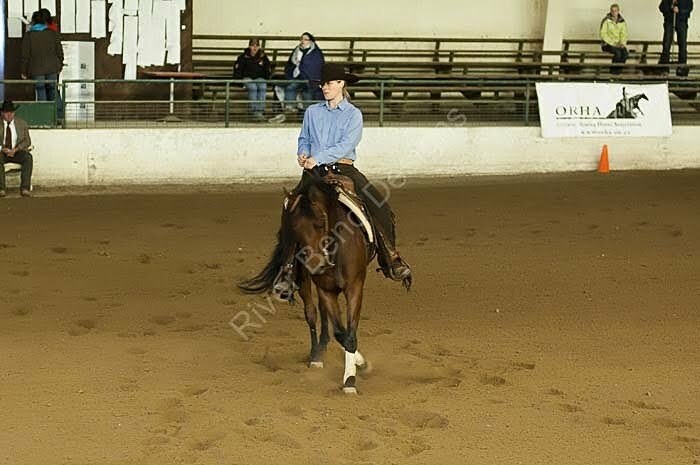 The reining clinic last weekend was a huge success. Jordan Larson, NRHA's youngest Million Dollar Rider, who also holds an NRHA judges card was a fantastic clinician. We got to see a little bit about how Jordan coaches his non-pro riders, and watch him ride a horse owned by the facility owners who had a first place finish at Congress last year! Guess who was participating in the clinic???? ?